Before we get into the nitty-gritty, let’s review exactly what a boosted post is. 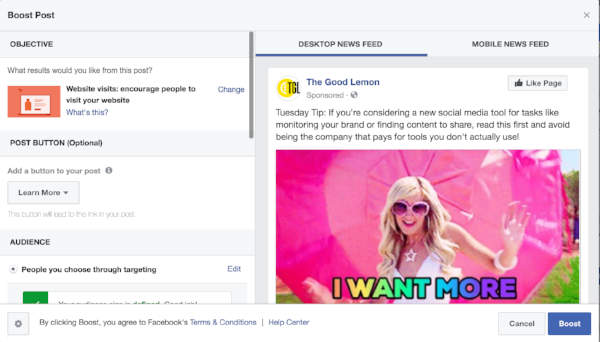 According to Hootsuite, “a boosted post is a post from your business Page that, for a fee, can appear higher up on your audience’s (or your selected audience's) News Feeds. The fee depends on how many people you want the post to reach—the payment depends on the number of impressions the post gets with time.” Basically, a small fee for more guaranteed eyeballs. Pick your post: While you can draft a post specifically to be boosted, we suggest advertising newcomers to boost a recent post that’s already performing well and that links to your website. That way, you already have some confirmation that the content will resonate with your target audience. Go to your selected post on your company page and look for the blue button that says “Boost Post." It’s located at the bottom right of your post, directly above the likes, comments, and shares. Click that button! Are you seeing a screen like the one below? If so, you’re in the right spot! What’s your objective? You have three options based on the type of result you want to see from your post. You can choose Website Visits (it's what it sounds like: send people to your website); Engagement (meaning encourage interactions with your Facebook post, such as comments or likes), or Messages (if you want users to use the Messenger App to interact with you directly). Frozen with indecision? We suggest Website Visits at first, to drive traffic back to your website and help users learn more about you. Choose a Post Button. Be as specific as possible with how you want your audience to engage with your post; don't leave a question in their minds as to what the next step should be to engage with you. You'll see that Learn More is the default choice, which is totes boring; highlight your adorable products with “Shop Now,” or drive newsletter sign-ups with “Sign Up." You get the point! People who like your Page: Okay, so this is the simplest option. Your post will be boosted to people who already like your Facebook Page. You can narrow this by location or age range if your post is intended for just part of your audience. People who like your Page and their friends: You trust your friend’s judgement right? That’s what Facebook is betting on with this option. Your post will be shown to your audience and your audience’s friends, so they can have that “oh, I didn’t know Becky loved that spa, I’ll have to try it!” moment. It's called social proof and it works. People you choose through targeting: This is the most complicated option. But have no fear, this can be great if you don’t feel like your posts are reaching your intended audiences, if you want to reach a very specific group, or if you have a very small following. To make your audience selection, click on "Edit," right next to the "People you choose through targeting" option. You’ll see a screen that looks like the one below. Think of this screen like a game. You want to make your audience defined, without being too broad or too specific. With each selection you make, the indicator at the bottom of the screen will move, showing you your potential audience size. Keep this in the green! On this page, you can select your target gender, age ranges, locations, and detailed targeting. Detailed targeting is where you can select your ideal target audience's interests, behaviors, or other defining characteristics, such as buying habits or education. Take some time playing around with this to find your sweet spot; here are some good combos to get you started. Set your budget: So, you know why you’re boosting a post and to whom you’re boosting it; now is the time to pick your dollar amount. You can select your own budget of as low as $5 (skip your morning Starbucks and you're there!). Just keep in mind that the minimum budget is $1/day if you want your promotion running over a longer period of time. If this is your first boosted post, we suggest picking something like $15 to $20 and setting the boost to run over a week or so. This is a long enough period of time for you to gauge a reaction and start seeing what works and what doesn’t work for you. Add your credit card, hit boost post, and you’re good to go! And, if you notice that it's not reaching many people or driving much engagement after just a day or two, you can always turn it off and try again with a different post. Start small: You don’t need to throw a ton of money behind your boosted posts to see what works and what doesn’t. We know advertising budgets are often the first to get cut (if you have any money set aside for that at all), so try smaller amounts first while you’re getting a hang of it. It takes time: It can take awhile to find what works to get the engagement you want. Boosting posts is a great way to confirm or disprove assumptions about your audience and what they want. Don’t be discouraged if some boosted posts barely get any engagement; instead, think about the post itself and why that might be. Is it the selected audience? The language? Make tweaks and test another post to see. Sometimes it’s a flop: Not getting any engagement at all or notice a big old typo in the middle of your post? We repeat: you can stop your boosted post at any time!